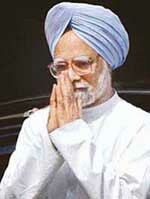 Seeking to assuage the sentiments of the Sikh community, Prime Minister Manmohan Singh today apologised on behalf of his government for the 1984 anti-Sikh riots, saying he was not standing on any “false prestige” and his head bowed in shame. That heads had to role in the Congress following the G T Nanavati Commission report on the 1984 anti-Sikh riots was evident. In the second head to roll following indictment of Delhi Congress leaders in the Nanavati Commission report, senior party MP, Mr Sajjan Kumar today resigned as Chairman of Delhi Rural Development Board. Kumar, who represents Outer Delhi in Lok Sabha, sent his resignation to the Chief Minister, Mrs Sheila Dikshit, who accepted it. A majority of Mohali residents know Inderjit Kaur of Phase 11, only as a former councillor. But there are a few who know her as the fearless daughter who risked her life while facing the fury of a crowd bent upon killing her father during the 84 riots in Shakarpur, New Delhi. After holding out for two days Union Minister Jagdish Tytler finally resigned from the Cabinet tonight. Mr Tytler handed over his resignation letter to Congress President Sonia Gandhi after Prime Minister Manmohan Singh assured the Lok Sabha that the Centre would conduct a fresh enquiry against persons who drew adverse comments in the Nanavati Commission report probing the 1984 anti-Sikh riots. Rejecting criticism against him, the then Principal Secretary to Prime Minister today charged the then Delhi Lt Governor P.G. Gavai with making “totally incorrect” statements with regard to dealing with the anti-Sikh riots in the capital. Disappointed with the findings of the Nanavati Commission, the Delhi Sikh Gurdwara Management Committee today demanded action against the Congress leaders named in the 1984 riots probe. Rejecting the action taken report (ATR) of the government on the Nanavati Commission report, the Opposition today demanded registration of cases against the guilty in the anti-Sikh riots in 1984 and additional compensation to the victims. The BJP today upped its ante against the Congress-led UPA government on the Nanavati Commission report asking Prime Minister Manmohan Singh to either distance himself from his party or apologise to the nation. It also asked the Prime Minister to get cases filed against the guilty and remove “suspected” ministers from the Union Cabinet. Shiv Sena chief Bal Thackeray said today that he had prevented the massacre of Sikhs in Mumbai following the assassination of former Prime Minister Indira Gandhi on October 31, 1984. The Rajya Sabha was adjourned for the second day today as a determined Opposition stalled proceedings demanding action against those indicted by the Nanavati Commission. Congress MP Ashwani Kumar has said that the final outcome of the Nanavati report will be such as would be consistent with constitutional propriety and conveying the sensitivity of the people. Time can dull memories but not pain. All it takes is a single episode and the wounds reopen. For Manjit Singh and his wife Inderjit, even 21 years after their house and shop were reduced to ashes, fear of death still comes alive as it did when they saw the angry mob armed with bricks and burning flames on their doorstep on November 1, 1984. Faced with an Opposition onslaught and adverse public reaction on the Centre’s response to the Nanavati Commission report on the 1984 anti-Sikh riots, a worried Congress went into damage control mode today. Twentyone years after the sequence of cruel events, which changed their lives forever in 1984, horror lives on in their minds. Even if they wanted to, the ensuing circumstancely ensured that they relived the horror, day after day, year after year. Former Prime Minister Atal Bihari Vajpayee today launched a determined attack on the UPA Government saying that people named in the Nanavati Commission report on the 1984 anti-Sikh riots should resign from the Council of Ministers and asserted that as Prime Minister Manmohan Singh too was responsible for the Action Taken Report. Vishwa Hindu Parishad working President Ashok Singhal has categorically told the National Commission of Minorities that his organisation looks upon the Sikh Panth with great admiration and pride along with recognising the Sikh community as having a separate religious identity. More than two decades later, the Justice Nanavati Commission report has revealed that only one police official, Amir Khan, ASI of Trilokpuri, was convicted in the 1984 anti-Sikh riots in which more than 3000 Sikhs were killed in Delhi alone. The Delhi unit of the Shiromani Akali Dal plans to `gherao’ Parliament tomorrow to protest against the government’s action taken report to the Nanavati Commission’s findings, which had indicated Union Minister Jagdish Tytler for his involvement in the 1984 anti-Sikh riots. The Justice Nanavati Commission, which had the mandate to probe afresh 1984 anti-Sikh riots across the country, has confined its observations only to Delhi even though it had received 2557 affidavits from all across the country, of which over 40 per cent were from outside the Capital. As one enters the Apollo hospital in the far away Sarita Vihar to know about the condition of Mr H.K.L. Bhagat, former Information and Broadcasting Minister, accused of inciting Congress workers’ crowds to kill and rob Sikhs during the 1984 riots in the national Capital, one is stopped by the hospital security guards. Heat is finally turning up against Union Minister Jagdish Tytler with the Left parties joining the issue on the Nanavati Commission by asking the government today to launch prosecution against those whose culpability has been indicated by the Commission of inquiry into the 1984 anti-Sikh riots. The SGPC chief, Bibi Jagir Kaur, today said the Political Affairs Committee of the SAD (Badal) would be convened on August 13 and 14 to intensify the protest against the failure of the Congress government to provide justice to the thousands of victims of the 1984 anti-Sikh riots. The Shiromani Akali Dal will take out a protest against the Central Government for “giving a clean chit to those responsible for the 1984 riots”, stated SAD chief Parkash Singh Badal while interacting with mediapersons here today. The Pradesh Congress Committee is finding it difficult to explain the inaction of the UPA government over the recommendations of the Nanavati Commission that probed the 1984 anti Sikh riots. Besides the then Delhi Police chief being directly indicted by the Nanavati Commission for his failure “to take prompt and effective action” during the 1984 anti-Sikh riots in the Capital, there were 22 other police officers against whom criminal cases were registered. The Nanavati Commission of Inquiry into the 1984 riots, terming it as an organised attack on the Sikhs, has indicted Union Minister Jagdish Tytler saying there was “credible evidence” against him, that he had “very probably” had a hand in the organising attacks and demanded that the government should take “further action as may be necessary”. In a significant development, Justice G.T. Nanavati today expressed dissatisfaction with the Action Taken Report tabled by the government following his voluminous report on 1984 anti-Sikh riots. Despite the hue and cry in different sections of society on the Nanavati Commission Report and the ATR, the Centre today defended its decision not to go ahead with the prosecution of Union Minister Jagdish Tytler on “mere probability” of his involvement. Akalis today decried the action taken report on the Nanavati Commission on 1984 anti-Sikh riots as a “mere eyewash”, and blamed Prime Minister Manmohan Singh for his failure to secure justice to the members of the community even 21 years. Lashing out at the action taken report on the Nanavati Commission’s findings as a “white wash report”, the Bharatiya Janata Party today said the NDA leaders would soon meet the President and demand action against the accused in the 1984 anti-Sikh riots. Since the 1984 anti-Sikh riots that followed the assassination of the then Prime Minister Indira Gandhi, in which over 3,000 persons were killed, the government had appointed 10 commissions and committee to inquire into the incident. The Congress is all set to launch a blistering attack against the BJP for questioning Prime Minister Manmohan Singh’s credentials as a Sikh following the UPA government’s response to the Nanavati Commission report on the 1984 anti-Sikh riots.